In our always on, 24/7 life we often find ourselves stretched thin and can be at real risk for burnout. It doesn't have to be that way though! While Balance my be a myth, seeking balance and striving for the best version of ourselves is always within our reach. With the spirit of the PIRATE crew, we share what it means to Balance Like a Pirate with passion, purpose, and priority. There is probably no greater need for educators than understanding how to care for themselves so that they can better care for others. 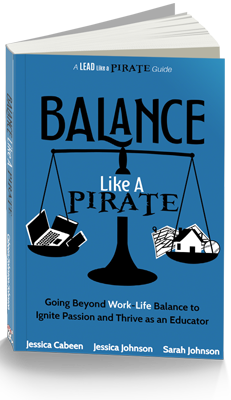 "Balance Like a Pirate" is a practical and helpful resource for education leaders wanting to refocus their priorities. Thank you Jessica, Jessica, and Sarah for providing a platform where school leaders can be real about their passions and pitfalls. And thank you for sharing such valuable takeaways and solutions from your own experiences! "Balance Like a Pirate is a must read for all educators. Deeply rooted in research-based methods and mindfulness practices, these incredible leaders provide honest, real-life examples with practical solutions that can be implemented immediately to help even the most burnt-out educators rediscover their passion while living their best life. Balance Like a Pirate won’t just change your mindset, it will change your life." 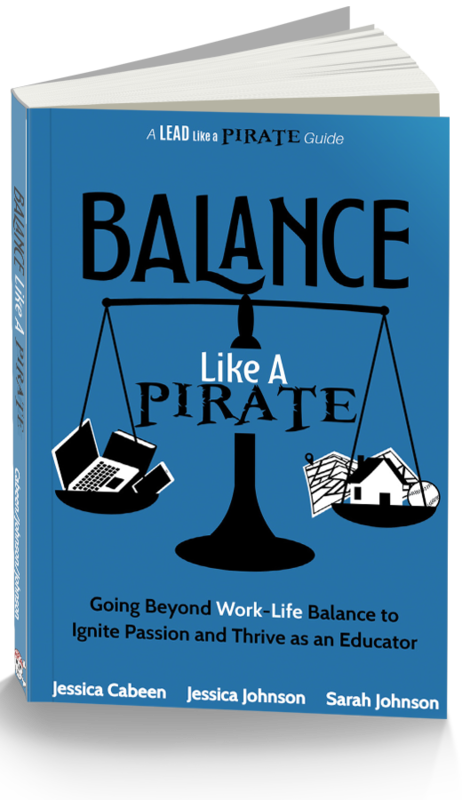 "Balance Like a Pirate is an important book for all educators—professionals who too often are overworked and overstressed. This book moves beyond platitudes and, instead, offers keen insights, resources, personal stories, and action steps for moving beyond ‘work-life’ balance and simply doing a better job at ‘life-balance.’ This book is written by three highly respected educators who share their own struggles with balancing Personal, Professional, Passion, and Positional responsibilities as well as their solutions for overcoming such struggles. If you serve as an educator in any role, you must read this book. It will resonate with you and rejuvenate you. Get ready to ‘set sail’ on a journey you will not soon forget and which you will want to return to often as a way to serve your students, colleagues, friends, and family members more passionately. "You. Need. This. Book. Trust me. As an elementary teacher, global keynote speaker, CEO of my own company, author, fitness fanatic, faith-filled Christian, dog mom, and proud auntie, Balance Like a Pirate resonated with me on so many levels. After reading this book, I’ve found the four balance quadrants (personal, professional, positional, and passions) to serve as a valuable guide in my efforts to fit it all in, focus in and do it well, reframe my day, and identify the true priorities and non-negotiables with my time. This book helped me reflect and reprioritize. What are you waiting for? If you’re hoping to regain balance, let go of the things out of your control, and free up time and space for you, start reading now! You won’t regret it." —Kayla Delzer, Globally Awarded Teacher, Author, CEO: Top Dog Teaching Inc.
"Balance Like A Pirate, supports school leaders with reflection and empathy. The three authors, using gripping personal examples and humor, show you why it is important to seek balance in your life and share with you how to create balance through innovative strategies and common sense reminders. This text equips you with the tools you need to be a reflective leader for children and others. The three authors demonstrate a intimate understanding of the struggles of school leaders and teacher but, show you how not only to survive bad days, but build to being stronger for tomorrow. The authors’ deeply personal examples will build your own empathy, build your awareness of your own issues, and support greater reflection of your leadership and life balance." Balance Like a Pirate: Order Now! Balance LAP is available in bulk rates for schools and leadership teams through Dave Burgess Consulting, but signed copies can be purchased directly from Jessica Johnson.